Here is our guide to the best horse racing and sports tipping apps. Improve your chances of winning by getting expert betting advice on any sport delivered to your Android, iPad, iPhone, Windows Phone or Blackberry. OLBG is an online betting community who's aim is to find it's readers interesting gambling opportunities. They've now released FREE iOS app that offers expert advice and tips across a whole range of sports, including football, horse racing, tennis, boxing, cricket, golf, rugby, snooker and every major U.S. sport. Upcoming events can be viewed either by "Popularity" or "Event Time" There is also a very useful "Hot Tip" section which the most hotly tipped upcoming horse races and games. The app makes it very easy to share your newly acquired knowledge with your friends via email or on Facebook and Twitter. The app is free to download and you don't need to register. Enable geo-location and it will even tell you what upcoming events are happening in your locality. 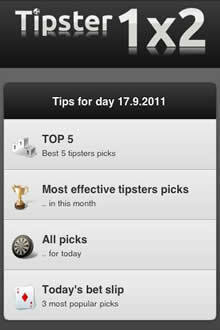 Tipday is a free sports tipping app that is available for both iOS and Android devices. The app currently offers betting advice on a variety of sports, including football (soccer), basketball, rugby union and rugby league. Users are invited to predict both scores and results of thousands of different fixtures, including every English Premier League and Spanish La Liga game. Tipday uses real-time betting odds provided by major bookmakers to let users see how profitable their tips actually are. The home screen is broken into two sections: "Popular" which displays the most tipped fixtures and "Upcoming" which displays tips for every match about to kick off. From the main menu you can select "Top Tipster", which will display a league table of the most successful tipsters using the service. 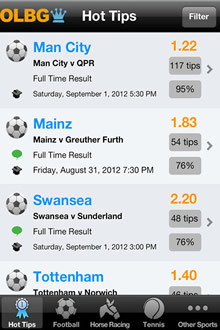 You can see at a glance what percentage of their tips won and choose to copy their "Active Tips" if you wish. The app also offers a wide variety of other features, including "Find a Friend", "Promotions" and "New". Every racing fan in the United Kingdom and Ireland should have the Racing Posts excellent free app installed on their iOS and Android device. 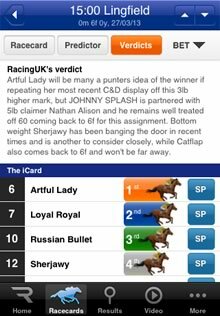 Not only does the app provide detailed racecards, breaking news, results, form guides and live commentary, it also also offers users a variety of ways to improve their chances of picking the winner of most races. By selecting the "Tips" tab in any racecard you can easily see how often each horse was tipped by an industry expert or by a leading publication, including The Guardian, Daily Mail, The Express, The Sun, The Star, the Telegraph and The Times. The app also gives predictions based on a complex mathematical algorithm that uses the most up-to-date stats and ratings on every horse to provide a unique independent prediction on every race. The placing are displayed graphically. 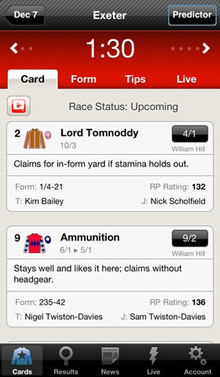 The app also offers their "Diomed Verdict" on every race from the renowned tipster. Info Bet Tips offer daily betting picks on a variety of sports, including football, soccer, basketball, tennis, NFL, volleyball, baseball and more. The app features a notification system that will alert you when the daily picks have been been uploaded so you never miss a betting opportunity. You can filter the various picks by selecting a particular sport from the top menu. From the index page you can see at the glance the various tips and plus information on the date of the event and start time. Clicking on an individual tip will reveal more information about the betting odds plus a pretty detailed Summary and Description section which explaining in more detail the reasoning behind each tip. What we particularly like about this app is the fact that they publish their winning/losing ratio. By clicking on the Statistics option in the main menu, you can see a pie chart that displays the Win, Void and Lost bets for each sport in an easy to read pie chart. Their Facebook page is also worth checking out for additional information and updates. Racing U.K. is a subscription TV channel that broadcasts horse racing from 30 U.K. racecourses. Besides providing the usual racing news, racecards, form, live video and results, the app also offers a pretty comprehensive tipping area for all UK, Irish and South African races. A subscription is required to watch live racing on your phone or tablet, but everything else is free. Users can choose to get their betting advice by selecting either the Predictor or Verdicts buttons from inside . The "Predictor" using complex computer algorithms that used over 70 form parameters for each horse to produce a prediction of the races placing. Alternatively take your betting advice from Racing UK's team of leading industry experts. 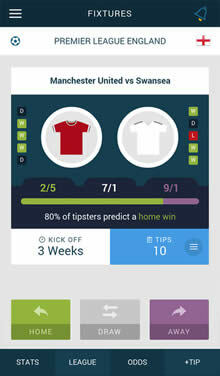 The Tipster1x2 sports tipping advice for iOS and Android devices provides betting tips on a wide range of sports, including soccer, football, tennis, basketball, golf, ice hockey, baseball and more. 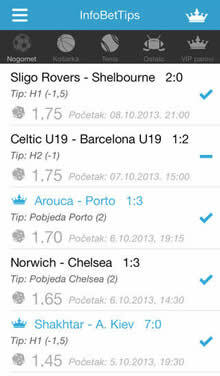 The app does not use in-house tipsters or computer generated predictions. Instead it functions similarly to the OLBG app in that it draws on the combined knowledge of thousands of tipsters in its betting community. What sets the Tipster1x2 app apart from the competition is that it offers data on the effectiveness and profitability of each tipster. Before you gamble any of your own money, you can check a persons betting history and their position in the rankings. From the homescreen you can choose to view the top 5 tipsters picks, the most effective tipsters winning picks for this month, the 3 most popular picks on any given day, plus much more.